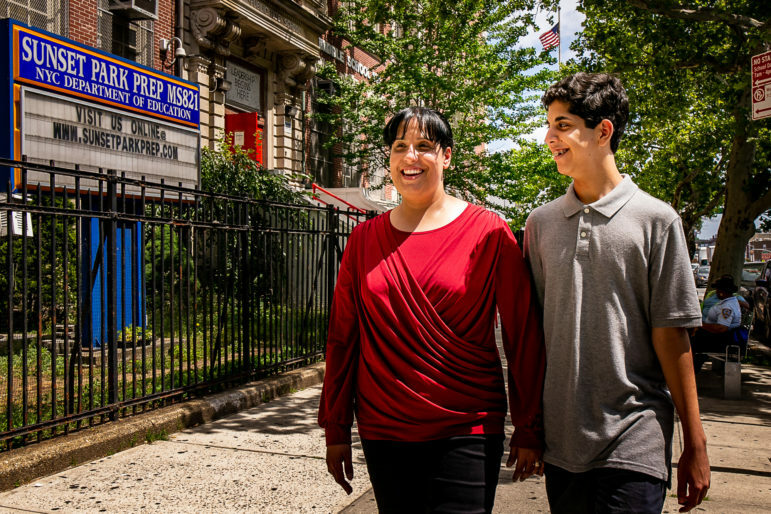 Feryal Abuhammoud with her son Omar, who graduated from Sunset Park Preparatory in June of 2018. Feryal, a member of the District 15 working group, says she thinks having some kind of screen can be a good way to incentivize all students to work hard. While the debate continues over the mayor’s plan to address the disproportional lack of Black and Latino students at specialized high schools, some school districts are adopting policy changes to address school segregation on the neighborhood level. In one Brooklyn school district, a locally-driven effort is moving toward large reforms that aim to make the district’s 11 middle schools more integrated and inclusive. 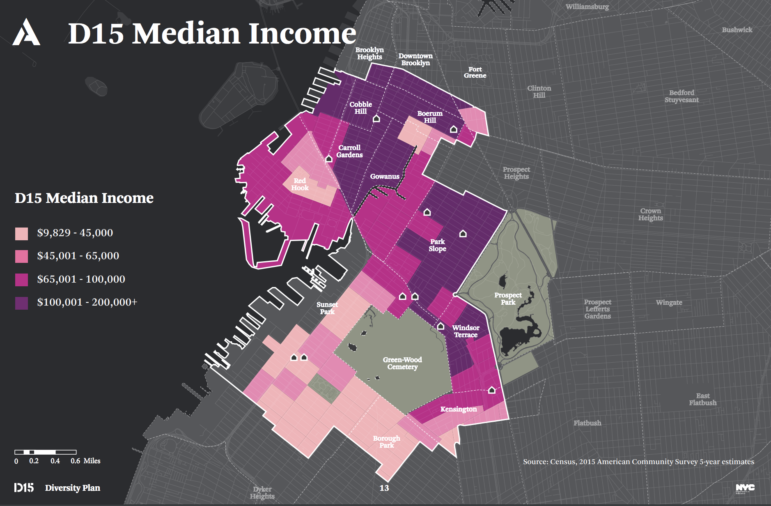 District 15 encompasses more affluent, majority White neighborhoods like Park Slope, Carroll Gardens, Boerum Hill, and Windsor Terrace, as well as neighborhoods with large low-income communities of color like Red Hook and Sunset Park, and economically mixed areas like Kensington and Gowanus*. In the 2016-2017 school year, the district’s middle school population was 42 percent Latino, 31 percent White, 12 percent Black and 12 percent Asian. The district has no zoned middle schools—a condition true of roughly a third of the city’s 34 school districts—which means 5th graders rank the district’s 11 middle schools in order of preference and are matched to a school based on their choice and on the school’s admissions policy. Yet District 15 middle schools are segregated: White students make up more than 50 percent of the student population at just three middle schools. Two schools in Sunset Park, by contrast, are more than three quarters Latino. Economic segregation falls along the same lines: at each of the three majority White schools, fewer than a third of students qualify for Free and Reduced Lunch, while at the two Latino schools in Sunset Park, nearly 100 percent qualify. 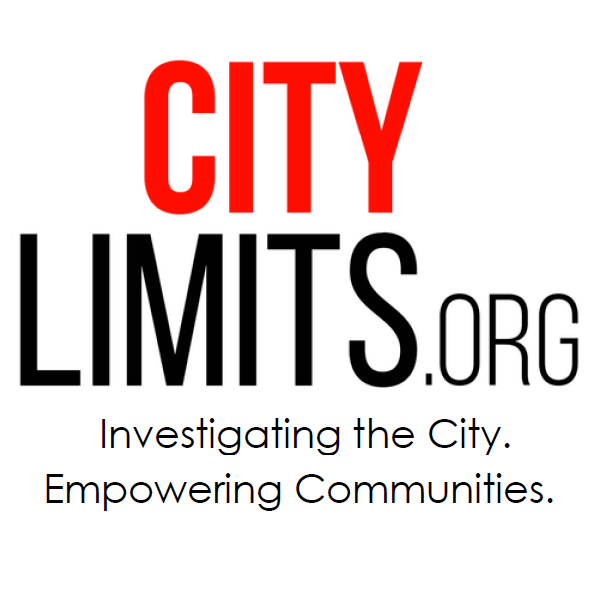 In the summer of 2017, following encouragement from neighborhood constituents, the Department of Education (DOE) provided $150,000 to the urban planning firm WXY to facilitate a community engagement process dubbed the “D15 Diversity Plan.” The DOE and WXY, with local input, formed a working group of stakeholders that the DOE tasked with creating an integration plan by the following summer. A list of recommendations released by the working group on June 20 calls for several changes to the middle school admissions process. Currently, most of the district’s middle schools use “screens”—some combination of standardized test scores, report card grades, auditions, admissions tests, behavior, attendance and tardiness records—to choose which students they want to accept from among those applying. The plan would do away with screens and give a preference to students from vulnerable populations for a percentage of seats in each school. And the plan goes further, calling for a number of initiatives to change the way parents choose schools and to make school environments more inclusive of all students. While the recommendations are ambitious and multifaceted, there remain for some stakeholders a wariness about the potential impact of the plan on low-income families and a concern about the underrepresentation of marginalized communities in the planning process. Participants faced a short time frame to come up with a plan, and certain aspects of it remain vague. There is also a possibility that some parents who prefer the use of screens will protest the changes. And the plan still requires DOE approval—and supporters say they’ll need the DOE to commit to the entire plan, and provide significant resources, for it to be truly successful. ... and median incomes in the district. The impetus for an integration initiative came from several sources in District 15. Councilmember Brad Lander, whose district overlaps with four of the 11 middle schools and its more affluent neighborhoods, has spearheaded the Council’s research on segregation and in 2016 proposed that District 15, as a first step toward integration, give priority to low-income families for a percentage of seats in each middle school. Anita Skop, the District’s Superintendent, has used grant funding to require every school in the district form an “equity team,” which works to cultivate respectful and inclusive school environments. In addition, a couple parent groups have formed to advocate for a fairer middle school application process. Miriam Nunberg, a former attorney at the federal Department of Education’s Office of Civil Rights and a White parent in the district, says she co-founded Parents for Middle School Equity in 2014 because she was concerned the existing system violated civil rights law and perpetuated discrimination. She and other parents were also frustrated by the stressfulness of the middle school application process. While the majority of the group’s members reside in the district’s affluent, majority White neighborhoods, she says a petition the group conducted throughout the district confirmed interest in some kind of middle-school reform throughout, leading her group to advocate for the launch of a district-wide discussion. Sunset Park and Red Hook Councilmember Carlos Menchaca says that in the neighborhoods he represents, parents’ focus is primarily on securing adequate and equitable resources for schools. “That is what matters to them – whether their children have access to computers or have the best facilities. Sunset Park [and Red Hook] families want to be able to send their kids to the schools nearby. Diversity already exists in Sunset Park because we have a vast immigrant community,” he says. He believes his constituents will support an integration initiative if it ensures they have access to quality schools in their neighborhood—and might have concerns about an initiative that fails to meet that goal. As reported by Chalkbeat last October, one Sunset Park parent, Javier Salamanca of Make Space for Quality Schools, said his group would not participate in the initiative and was concerned about being “tokenized”; he told City Limits the DOE should place a focus on resource equity—making all schools in the district great schools. But a couple other Sunset Park residents told City Limits they were eager to see the middle school application process reformed. Maria Diaz, a former fifth grade teacher in Sunset Park who joined the working group, says each spring her students received their acceptance letters, some would burst into tears. These discussions also come at a time when the DOE itself is taking a more active policy stance to promote integration, especially under the leadership of the DOE’s new chancellor, Richard Carranza. The DOE’s 2017 citywide diversity plan promised support for more district-focused diversity efforts. Lander says he and Menchaca (whose district overlaps with five of the 11 schools in the district) requested the DOE put resources toward District 15. Integration advocates point to studies that indicate the benefits of racial and economic integration in schools. As documented by The Century Foundation, a plethora of research suggests Black and Latino students perform better in diverse schools, largely because integrated schooling leads to improved access to resources, quality teachers and more. But a growing body of research also focuses on the pedagogical value of diversity for all students and especially White students: in integrated classrooms, students think more critically, consider new perspectives, and learn to overcome implicit bias, according to the research. While the process officially kicked off with stakeholder meetings in August 2017, the first public workshop wasn’t held into nearly February of this year. The initiative involved 12 working group meetings, over 80 community conversations, and four public workshops. This follows the lead of schools participating in the DOE’s Diversity in Admissions program, including all the elementary schools in Chinatown/Lower East Side’s District 1, which set aside a percentage of seats for students from marginalized communities. According to research provided by the Department of Education, screens like attendance and tardiness records as well as test scores disproportionately affect District 15 Black and Latino students, removing them from the applicant pool at schools they hope to attend. For instance, only 16 percent of White sixth graders, but 44 percent of Black sixth graders and 36 percent of Latino sixth graders had more than five tardies on their records in the 2017-2018 school year. “Why should a public school, especially on the middle school level, be able to screen for quote-on-quote ‘better’ kids? The premise … means that kids who perform badly should be in an entirely different school and that’s contrary to all the research,” says Nunberg. The issue is also one of fairness: Some parents note that students should not be punished for what may be their parents’ difficulty getting them to school on time. 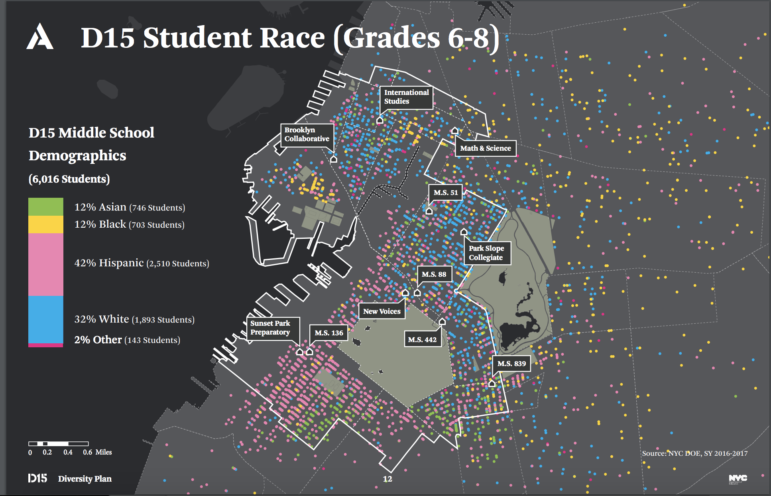 Research on District 15 shows that Black students—many of whom reside in the geographically isolated neighborhood of Red Hook—travel farthest to school compared with other groups in the district. Some question the objectivity of report-card grading or testing, especially for recently emigrated students who may have received little education in their country of origin. “These tests are not reliable to fully capture what students are able to do … The families that have the least amount of money get to send their children to the schools with the least amount of resources, which then has an impact on student performance,” says Australia Fernandez, an educator and a parent in Sunset Park. Some residents of the district might disagree with the elimination of screens. According to the results of a survey e-mailed to families in District 15 in June, 58 percent of those surveyed still believe it is appropriate to use screens on the middle school level—though that percentage might reflect the disproportionate number of residents from Park Slope who took the survey. Park Slope residents made up 37 percent of those who responded to the survey, and 62 percent of them expressed support for the use of screens. By contrast, only 42 percent of Sunset Park residents said it was appropriate to use screens. 78 percent of respondents in the district expressed support for giving weighted preference to students from vulnerable categories. The In the Upper West Side’, a plan to give admissions priority to poor students with low grades and test scores —spearheaded by District 3 officials, the DOE and some educators—faced strong opposition from many White parents. (The plan was approved by the DOE in June.) Thus far, there has been much less vocal opposition from White District 15 families, and Lander says he expects pushback might be gentler than it would have been five years ago because White affluent families are already gravitating to a wider range of schools in the district. David Tipson, executive director of the integration advocacy organization New York Appleseed and a White parent in District 15, calls screens an anachronism. “It goes back to this notion that we’ve got to convince … higher-income students to stay in the school system…That was definitely the ethos of the 70s and 80s when New York City was in fiscal crisis and there really was a risk of losing families to the suburbs, but it’s totally inappropriate for today,” he says. But Sabine Aronowsky of the Gowanus Neighborhood Justice Coalition (a group that formed last year to advocate for a just land-use rezoning in Gowanus) is still concerned affluent parents might opt to send their kids to private school, and suggests the DOE should grow the capacity of popular schools in order to accommodate more families. It’s not just some White affluent parents who maintain an interest in screens. Feryal Abuhammoud, a Sunset Park parent and a member of the working group, says she thinks having some kind of screen can be a good way to incentivize all students to work hard. Sunset Park teachers and parents Jessica Xu and Qiong Chan told City Limits they opposed eliminating screens because they feared high-achieving students would not otherwise be challenged. To address the latter, the plan recommends support for teachers to adopt proven models for teaching students of mixed academic levels within one classroom. The plan says that by the fourth year of implementation, the DOE should assess whether each school falls within a 40 to 75 percent range for low-income students. Parents will still rank their choices, and just how fast the demographics of each school will come to resemble those of the district will depend on how District 15 families rank schools, as well as some technical details still to be determined, such as how many schools each applying student will be required to list. According to DOE simulations, if the district eliminated the use of screens, and used a lottery for all school seats, but all families continued to rank schools in the same way, there would not be a substantial change in school demographics. The DOE also conducted a simulation that prioritized students from a variety of academic levels, and another simulation that prioritized students from a variety of elementary schools, but segregation still remained a factor due to family’s choices. White students usually apply to majority White schools and Hispanic students usually apply to predominantly Hispanic schools, suggesting local geography is still a major factor in families’ decision-making. The plan tries to tackle the challenge of changing how White families choose. It recommends various initiatives to ensure families of all backgrounds are informed about the admissions process, such as training guidance counselors and parent coordinators to provide non-biased information about all the middle schools and using the online middle school application process to teach parents about the offerings of each middle school. He argues that most middle schools in the district are high quality, even if some have higher test scores than others. But some members of the planning process stress that there are real inequities between the middle schools. “The schools, literally, can be night and day,” says Coletta Walker, a member of the working group and a representative from the Red Hook Community Justice Center. She says that among the middle schools in the district, there are differences in the quality of libraries, technologies, air conditioning, lunch food, after-school programming, and more. Such differences, she says, will require additional resources to address. For some, integration itself will be a big step toward fixing inequalities. But a few participants in the process and on the working group expressed concern that there has not yet been a significant analysis of the differences between schools—a task necessary both from a racial equity perspective, and as part of the process of convincing affluent parents to attend a wider range of schools. The exact cause of resource disparity is complex. Since 2007, the Department of Education’s per pupil funding formula has required additional allocations for students from disadvantaged groups, but due to underfunding by the State Department of Education, many New York City schools continue to receive less than what they’re entitled to under the formula. Inequality in school resources can also come from differences in PTA contributions for each school. In the past, the DOE has resisted pressure to interfere with PTA funds, with a representative telling the New York Post this May that PTA finances are “largely independent of city oversight” and that there are currently no district-wide PTA pools. The plan calls for assessing and then addressing the inequities among schools, as well as monitoring Parent Teacher Association (PTA) contributions and encouraging “intra-district fundraising” and collaborations between PTAs. The plan also recommends that majority low-income schools that economically diversify do not lose their Title 1 funding—but how exactly this will be implemented is not yet clear. Low-income families of color may also have reasons why they’d choose to continue attending schools that are mostly Black and Brown. Tracey Pinkard, a member of the Gowanus Neighborhood Justice Coalition, resident of the public housing complex Gowanus Houses and a parent coordinator at one of the middle schools, says that if a highly competitive, majority-White school suddenly became more accessible to families of color through changes to the admissions process, she doesn’t think Gowanus Houses residents will automatically jump to the opportunity. She says certain schools are valued by residents of public housing due to their proximity, familiarity, and their reputation for inclusivity of students regardless of their circumstances. The Diversity Plan recognizes that transportation is a significant factor in affecting families’ choice of schools, particular for low-income families without cars and working long hours. It recommends updating the DOE’s Metrocard policy to make free subway trips more accessible, piloting a bus program for 6th grade students traveling beyond one mile, and establishing travel groups between families with children going to the same school, among other ideas. It also recommends the creation of a middle school in Red Hook: a plan is already under discussion for a Maritime Middle School in the area. The final plan also includes a number of recommendations relating to improving school inclusivity, such as anti-bias trainings for school staff, families and students, changes to make school curriculums more inclusive of all identities, and the use of restorative justice practices to address racial disparities in school discipline. Another priority is hiring more teachers of color to reflect the district’s diverse population (currently, 67 percent of District 15 teachers are White). Members of the Gowanus Neighborhood Justice Coalition are eager for these inclusivity measures but still have concerns, including about travel burdens, the prevalence of discriminatory policing outside of schools, and more. Coalition member and Red Hook Houses resident Karen Blondel recalls when her son went to the specialized performing arts school La Guardia but was embarrassed by the fact that he didn’t have lunch money to go out like his peers. Ultimately, she says he felt so ostracized that he transferred to a non-specialized high school. She does not want to see that happen again for other students in the district. “It’s that feeling of never feeling like you belong. Across the board, whether it’s dealing with the schools or police or housing, we’re always left to feel like it’s not ours, it’s not our decision to make, it’s not our decision to own or to feel responsible for,” she says. Issues of “inclusion” and “ownership” are especially acute in District 15 given its housing history—of redlining and racial exclusion, on the one hand, and gentrification, more recently. The White school-aged population of the district has grown from 19 to 30 percent over the past decade. Concerns about a lack of diverse voices in the planning process itself were voiced by many participants. Several participants, however, said they felt WXY and the DOE had taken steps to improve outreach, and a few said that it was one of the most thorough engagement processes they’ve seen conducted by the DOE thus far. WXY originally planned to launch the working group in September, but took an additional two months to invite more diverse representatives to sit on the working group. WXY also held all four of the public workshops in low-income neighborhoods, made an effort to provide childcare and translation (though it was not always comprehensive), and held additional stakeholder meetings with community groups in low-income neighborhoods. Even so, meetings held in predominantly minority neighborhoods appeared to be disproportionately attended by White residents, and stakeholders listed several ways that community engagement could have been improved and have called for continued outreach. While the plan does include recommendations pertaining to disabled students, one parent would have liked to see increased involvement of the disability community. The plan calls for investments in parent leadership development in marginalized communities. The working group will deliver a finalized, detailed version of the plan to the DOE by the end of July, and the DOE will issue a formal response by the end of the summer. Chancellor Caranza has expressed enthusiasm over the process in District 15, but working group members are anxious to see whether the DOE will embrace all the recommendations included in the District 15 plan, including many they say are interdependent. Several of the recommendations could take a significant commitment of resources; the plan requests the funding of three full-time new staff positions to coordinate the new initiatives. “We’re nowhere near done yet. We still need to be vigilant, persistent, tenacious and loud in ensuring all our recommendations are implemented,” said Zephyrin said at the June 20 meeting. The DOE is accepting comments on the plan until the end of July. Comments can be mailed to info@d15diversityplan.com. * Correction: The original version of this article omitted mention of Gowanus. District 15 is 30.11% white and 16.14% Asian so you actually have white and Asian kids to spread around. But do you really think that white and Asian parents are going to tolerate their kids having to go to 2nd rate schools and be dragged down academically? Many Asian families are leaving Sunset Park for Staten Island so their kids can attend better safer schools. So much of this is driven by where people actually live. D15 is an artificially drawn area where the different neighborhoods don’t have any affiliation to each other. Humans sort themselves into groups naturally, and this is gonna do little to change that. In the end, where you live, proximity to school and where their friends go matter more than anything else. Something that this article highlighted more than anything, but the recommendation from the diverity group has fundamentally missed. The recommendation seems to me fatally flawed by wishful kumbaya group think, where rational and practical suggestions based on data has been shunned in favor of identity driven politics peddled by interest groups. I hope the DOE is has the sense to see that it’s not practical to enforce, and it will drive parents of higher performing students to private and charter schools. The proper response to address the inequality is to funnel resources and money to underperforming elementary schools to give kids and parents in less privileged situations the same opportunities. Level the playing field from the ground up, instead of inserting artificial fixes later on when the circumstances are already skewed. You know you can’t include private and parochial schools in this plan. Are there even any parochial schools left in that district? WXY’s list of recommendations is much stronger than it was in the penultimate workshop, so it is to be commended for taking critical feedback seriously. It doesn’t go far enough, though. There is too much, “encourage” and “ensure” language, and not nearly enough “require” language. To be a serious policy, there must be sticks to go along with the carrots. Principals, schools, and superintendents who don’t make progress on these issues must be penalized by losing their jobs. No excuses. If they don’t perform the central role of their jobs, which is to deliver a quality education to every student, regardless of circumstances, then they should not continue to be employed by NYC taxpayers. Period. Moreover, the language in WXY’s list throws up some red flags when it calls for more funding. The NYC DOE is already lavishly, lavishly funded. They miss-spend $24 billion dollars, and still can’t crack the top three quartiles of student performance, nationally. In other words, NYC spends three times the national average per student, but delivers 1/4 the results. NYC taxpayers should demand their money back. For that kind of investment, NYC schoolkids should be the best in the world, not bringing up the tail end of education in a country whose public education system brings up the tail end of education in industrialized countries. It’s a disgrace, and must change. Inconvenient truth: Only 2 schools in Brooklyn had both greater than 25% of their eighth-graders receive Specialized School offers AND more than 25% of their student populations comprised of Black & Hispanic children (viz., MS 51 & Math and Science in District 15: “See Where New York City’s Elite High Schools Get Their Students” nyti.ms/2IDDfw3 . Empirically, then, the screening going on in D15 – a still relatively diverse District in an egregiously segregated City – is VASTLY more equitable than that taking place in SHSAT schools (or for that matter, not especially worse than ‘progressive’ Beacon & Bard HS in Manhattan). Watch it Here: Is Affordable Housing Really Fair Housing? What does it mean to take into account “fair housing” concerns as the city implements Housing New York and as it pursues neighborhood rezonings?